Chicken Satay with Warm Peanut Sauce, Thyme for Cooking gourmet recipes. 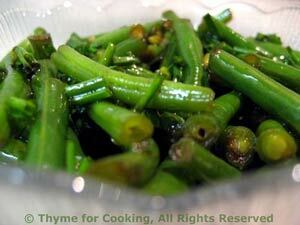 An easy summer dinner from the barbecue grill with an Oriental flavor. Grilled gingery chicken breasts with a peanut sauce you can make as hot as you like, served with an Asian-inspired brown rice and a crisp Chinese Bean Salad to round out the menu. 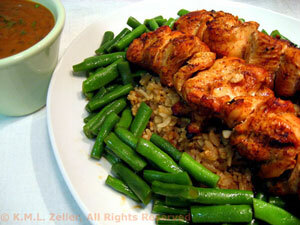 To serve, mound the rice in the middle of a platter, lay the skewered chicken on top and surround with the beans; Peanut Sauce on the side. Fresh ginger adds a bit of heat and a lot of flavor to this chicken. You can substitute 1/2 tsp ground ginger if you don't have fresh; and add more if you like the heat. For a hotter dish you could add crushed red pepper, Asian chili sauce or even Tabasco to the marinade and/or the peanut sauce. Soak skewers in warm water while preparing chicken and making marinade. Cut chicken breast into long strips, 3 or 4 from each breast. Thread the meat the long way onto the skewers, (sort of pleating it). Mix the rest of the ingredients in a small bowl. Place chicken skewers into a baking dish and pour marinade over. Allow to marinade for 20 - 40 minutes. When ready, remove from marinade and grill over direct heat for 8 - 10 minutes. Can also be done under the broiler (grill) for same amount of time. Or, you could skip the skewers and stir-fry them in 1 tbs olive oil and 1 tsp sesame oil. Serve with Peanut Sauce on the side. Heat oils in small saucepan. Add chives and chili powder and sauté briefly. Add remaining ingredients and bring to a boil, stirring well to combine. I use 'Uncle Ben's' which is all I can get and it is quick cooking. It looks like brown Basmati and cooks in 15 minutes. 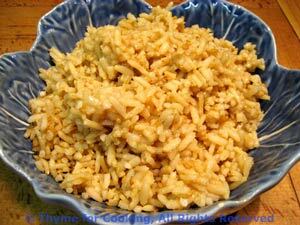 Cook rice according to package instructions stirring in the sesame oil, soy sauce and seeds when rice is almost done. Note: You can toast regular sesame seeds in a small, dry, skillet over medium heat for 5 - 7 minutes, until light brown. I originally found this recipe using asparagus in a Chinese cook book but it works well for green beans, too, and is perfect this time of year. Top and tail beans. Cut in 1 1/2" (3.25cm) lengths. Bring a medium saucepan half full of water to a boil over high heat. Add beans and blanch for 4 minutes, until crisp-tender. Drain beans and immediately submerge in an equal amount of very cold water. Drain again, spread out on paper towels and pat dry. In small bowl whisk together the oils and soy sauce. Pour over beans, sprinkle with chives and stir to combine.